One of the most incredible experiences in Iceland in 8 days, was the nearly 24hrs of sunlight when we visited in June. Since all the sights are in the great outdoors one can go sightseeing at any time (it’s a wonderful way to use jetlag). The sun sets for only a few minutes but the sunset lighting lasts for hours, which is ideal for dramatic photography. With long hours of sunlight, all the plants grow very fast and flowers bloom everywhere, forming miles and miles of vibrant blooms. 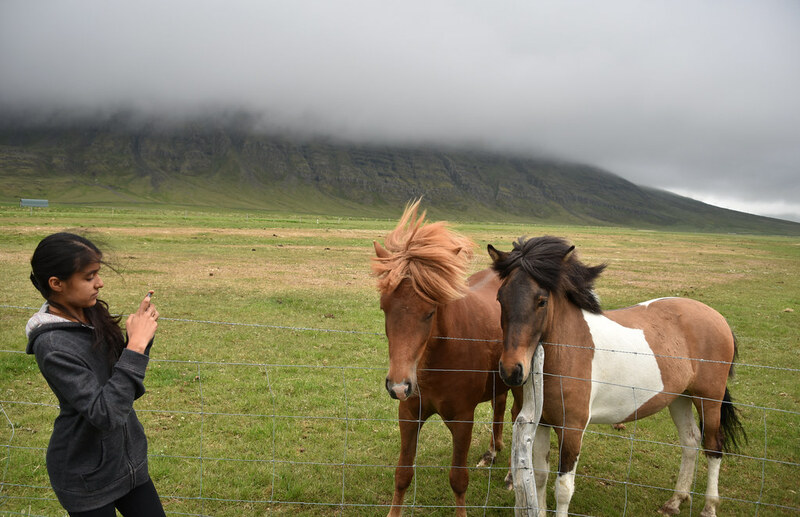 Check out the gallery of Iceland in 8 Days for some more pictures. Walk around the pretty harbor area. The unique Solfar (Sun Voyager) sculpture is worth a visit. The downtown has cool restaurants and fun to hang out. Hallgrimskirkja, the modern and beautiful concrete church is unlike any church. Drive up to Perlman, a beautiful glass dome restaurant, for amazing views and fine dining. Thingvellir National Park for many historical sites such as the first parliament between 10th and 18th century. Strokkur Geyser Gullfoss waterfall on Hvita River has the active and very dramatic geyser, geothermal activities and spouting springs. 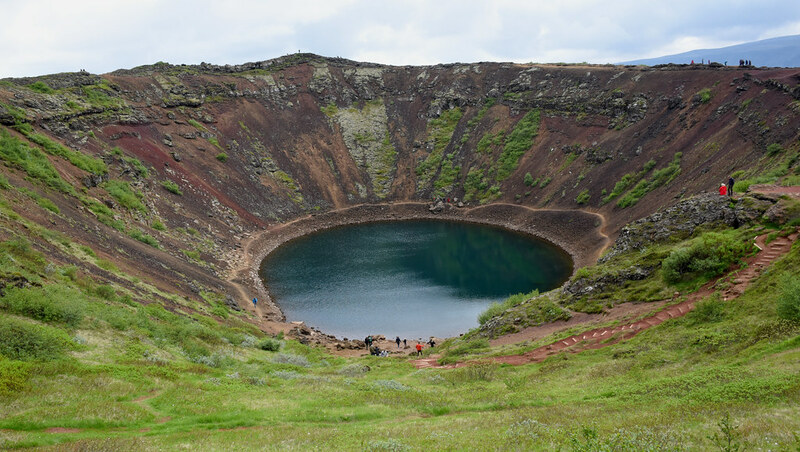 Volcanic crater of Kerid is one of crater lakes in the area, known as Iceland’s Western Volcanic Zone. Majestic Seljalandsfoss waterfall (go behind the waterfall), and the equally mesmerizing Skógafoss waterfall. At a slight detour from Vík, are the black volcanic beach and the dramatic Dyrhólaey (to see Puffins). The drive up to the lighthouse can be nerve recking with cliffs on both sides and no railing or warnings. We saw puffins nesting in along the cliff side. It’s best to visit in evening when the puffins return from their day out on the ocean to feed. Reynisfjara beach had Reynisdrangar rock formations and black sand beach (has puffins and other bird life too). Visiting Iceland in 8 Days, we got to drive around much of the vast open countryside for the breathtaking views. Svínafellsjökull (one of the tongues of Vatnajökull, Europe’s largest glacier) – two hikes in the national park. Hike brought us face to face with the glacier. 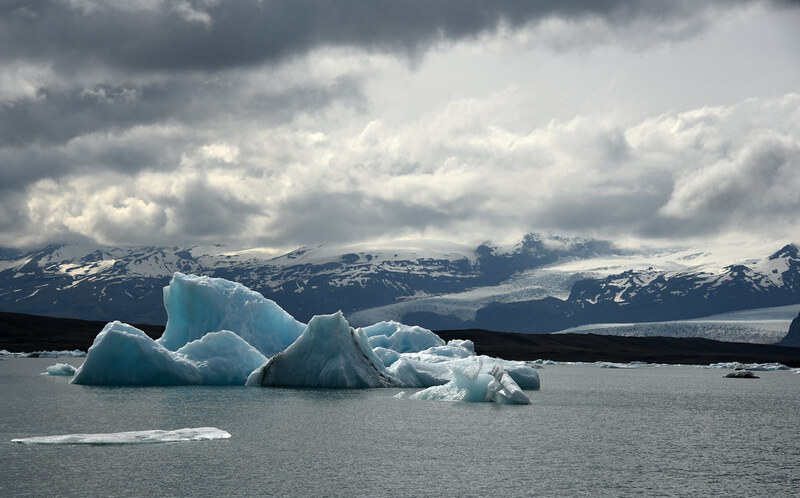 Cruise on Jökulsárlón glacier lagoon. It is one of Iceland’s most famous attractions and top photo spots. Situated in between Vik and Skaftafell Park is Fjadrargljufur Canyon. 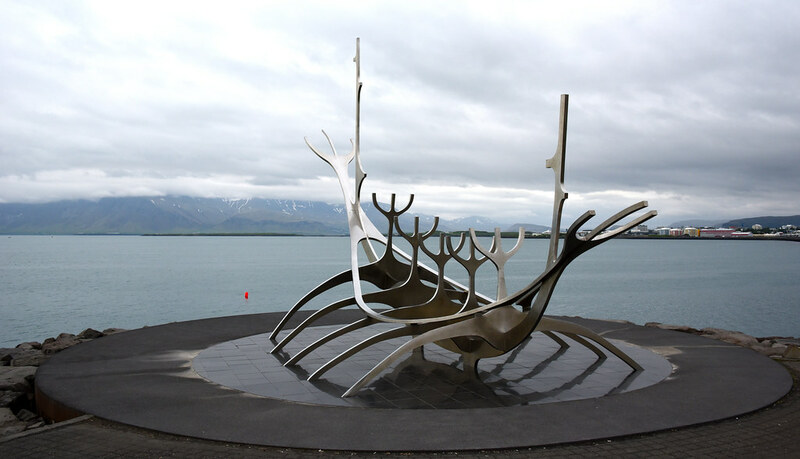 See the memorial to the lost fishermen in the harbour village of Höfn. Enjoy the stunning Icelandic countryside. Drive on a road that tightly curves with the sea through the coastal region of the East Fjords, enjoying spectacular views of high steel-grey mountains, deep fjords, spectacular waterfalls, glaciers, winding mountain passes, and quaint fishing villages. Stop at the wooded village of Egilsstadir, before continuing along mountain roads into the Icelandic interior and the highland farm village of Möðrudalur. 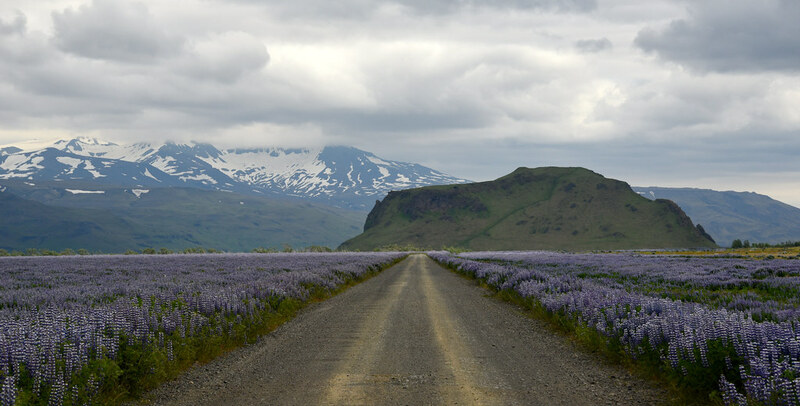 At 469 metres (1,539 feet) above sea level, Möðrudalur Valley is the highest inhabited place in Iceland, and snow can be seen almost year round. There are majestic views across Herðubreið, one of the most beautiful mountains in the whole country. On this day you drive through the spectacular East Fjords with towering mountains and charming fishing villages to the fertile Egilsstadir area. On the way from town Hofn in Hornafjordur you drive up north the east fjords, stopping here and there, like in the villages Djupivogur, Breiddalsvik, Stodvarfjordur, Faskrudsfjordur and Reydarfjordur. Drive around Lagarfljot lake where you stop at both historical places and places with special nature. Lake Mývatn area, known for its geothermal landscapes, including the Námaskarð Pass, the Skútustaðagígar pseudo-craters, the Dimmuborgir lava formations and Mt. Krafla, one of Iceland’s most visited volcanoes. Later on, take a dip in the soothing geothermal waters of the Mývatn Nature Baths. Hiking Trail Opens at Holuhraun Lava Field. 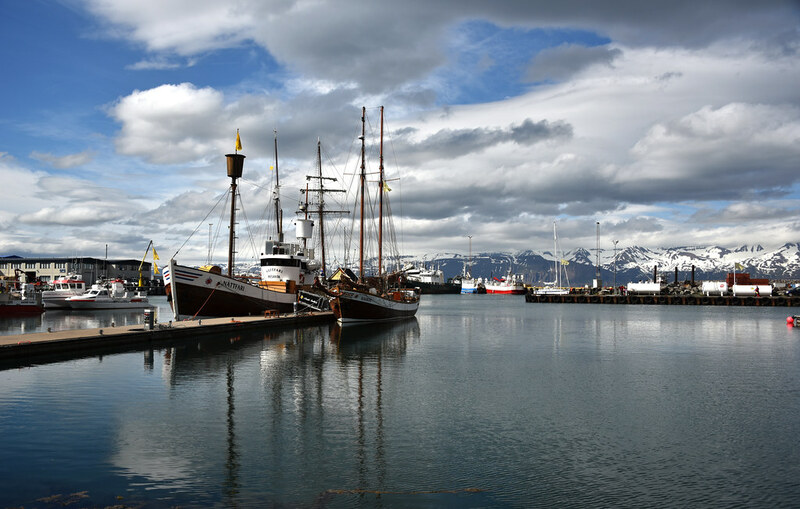 Husavik – whale watching capital of Iceland. And we were rewarded with the best whale watching of our life. We took a wooden sail boat out to see the whales and we saw so many whales so up close that at some point the sailer commented that if they came any closer we will have to get them to come on board. We did have a little adventure as our boat had a malfunction and we had to rescued on the open sea by another boat. Places not to be missed include Hverfjall, Dimmuborgir, Grjotagja, Skutustadagigar, Hofdi, Lofthellir, Leirhnjukur, Krafla and the hot springs east of Namskard, and last but not least the craters of Ludent and Viti (Hell). Near lake Myvatn, we were at the northern most point of our trip. At around midnight we left the hotel to see the sunset with a backdrop of the lake and the surrounding mountains. The lighting produced by the setting sun was magical, and it was such an outworldly experience to see the sun set little past 1230am. From Lake Myvatn, drive to Godafoss waterfall. On to Akureyri, a charming town. Continuing towards Skagafjörður, a valley known for its abundance of Icelandic horses, you will pass through the beautiful, mountainous area of Tröllaskagi, the old herring-fishing village of Siglufjörður, and Hofsós, where you can enjoy wonderful scenery while you relax in the town’s thermal pool. Visit Glaumbær Museum for turf-roofed houses. We also came across those unique houses along the road as well. we rode horses on such s beautiful train. The Icelandic horse have a unique gait which we experienced for the first time. Drive to Airport was through the scenic western side of Iceland. So many photo opportunities along the way. We especially stopped at a farm which had lots of horses of all ages interacting with each other. Our final stop before heading home was the bridge to over the continental divide. This is where the European and North American plates come together. We saw this first at the Thingavellir National Park, where the divide was filled with clear blue water, and one can dive there. Here the divide as filled with volcanic sand. What a wonderful visit to Iceland in 8 days! We’ll be back for more.